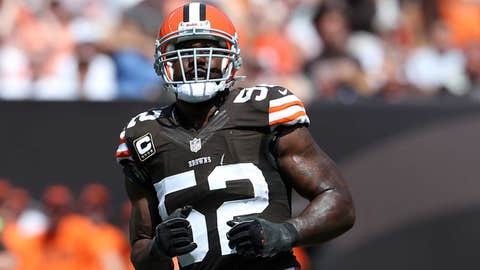 Browns linebacker D'Qwell Jackson remains good friends with Kellen Winslow Jr. and says he's not surprised by his former teammate's comments. Kellen Winslow Jr. is looking forward to facing his former team, the Cleveland Browns, this Sunday at MetLife Stadium. "Who’s going to guard me over there? Nobody," Winslow said. "That’s how I feel, and that’s how I play the game. That’s how you gotta play the game. You’ve just got to play the game, and that’s all." Pretty confident words coming from a guy who doesn’t see the field too often. Browns head coach Rob Chudzinski isn’t surprised at K2’s jabbering. "He’s thought that for years," Chudzinski, who coached Winslow as the Browns tight end coach in 2004 and offensive coordinator from 2007-08, said. "Oh there he goes," said Browns D’Qwell Jackson, who remains good friends with Winslow. "It’s no secret K2 likes to run his mouth alot. We game plan towards the guys who are gonna be on the field. He doesn’t play a whole lot so I’m not gonna get caught up in a guy that’s watching the game for most of the time that his offense is out on the field." Cornerback Joe Haden found humor in Winslow’s comments. "It’s funny," Haden said. "But what did you expect? I don’t really know him that well, but just hearing what kind of personality he has it seems like something a guy like that would say." Defensive back T.J. Ward, who most likely will cover Winslow said he didn’t want to give him any more motivation, but doesn’t think he’ll have any problems come Sunday.